How to purchase / rent a Keurig machine from you? 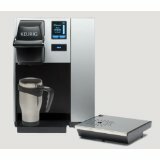 Looking at your website I can see you offer the Keurig 150 coffee systems, how do you purchase this from your website?? The B150 was available for a short time through Amazon. However, for whatever reason it is no longer available and the page listing this model was removed from Amazon. After researching for this model I couldn't find it in stock anywhere else either. Not sure what the reason is that it isn't in stock or listed anywhere.